Magento 2 Fastway Shipping: Fastway Shipping extension allows the customers to choose Fastway Courier shipping method for their product delivery. The shipping rates are automatically calculated according to the store address, product weight, and delivery zip code. The API fetches the real-time shipping charges and displays them to the customer. Magento 2 Fastway Shipping - Fastway is a courier delivery services corporation headquartered in New Zealand. Fastway offers high caliber cheap overseas courier services to a range of international locations. This is the subsidiary of the Aramex shipping company and provides Fastway Shipping method for shipping the products to four countries – New Zealand, Australia, Ireland and South Africa domestically. Using Magento 2 Fastway shipping module, the admin can manage the shipping and orders from his admin panel, enter the tracking ID and a complete shipping management from the admin panel. This module allows the customers to choose Fastway Courier shipping method for their product delivery. The shipping rates are automatically calculated according to the store address, product weight, and delivery zip code. The API fetches the real-time shipping charges and displays them to the customer. 1. Magento 2 Fastway Shipping is meant for domestic regions only, it will not work for cross-border shipments.The store address and shipping address must be of the same country. 2. The admin needs to enter the API key. For obtaining the API Key, please click here. 3. To find out shipping charges please click here. Calculate Shipping cost according to the Fastway Shipping. The admin can enable or disable the shipping method. The admin needs to enter his Fastway API. The admin can enter the Fastway Shipping method name that will be visible to the customers at the frontend. Shipping Rate depends on admin’s regional franchise, product weight, and the buyer’s destination. 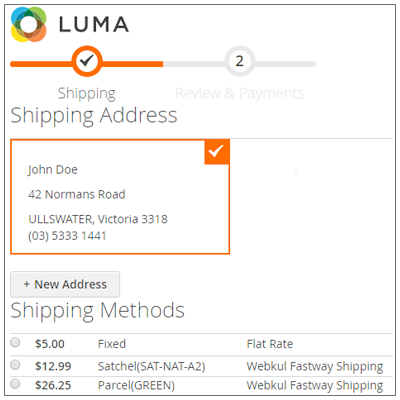 Enable the shipping method for checkout. Enable the sandbox(testing) mode by selecting “yes” else“No”for enabling the production(live) mode. 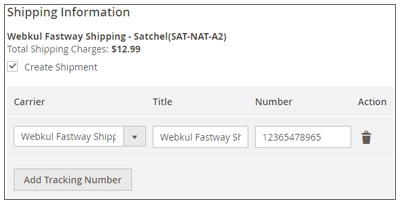 Enter the title for the shipping method that will be displayed on the checkout page. Enter his Fastway shipping account API Key. Select the weight unit as pounds or kilograms as required. Select the default origin country of the store. Select the default Regional franchise for the Fastway shipping. Select the countries where this shipping method will be applicable to. Select the specific countries where you want to ship to. Enter the displayed error message if the “Show Method If Not Applicable” is enabled. Select “Yes” to show the method if not applicable. Enable/disable to store the debug log information. 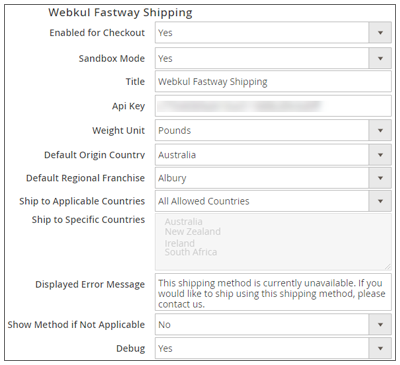 Buyers can see the Webkul Fastway shipping on the checkout page. Buyers can select the available shipping method as per the choice. Buyers can see the selected shipping method on the Order Review page as well. Buyers can see the shipping details of their orders under “My Orders” section. The admin can view and manage their orders. The admin can generate invoices and shipment for the orders of their products. And, can also generate the tracking number for the orders of their products. Can notify the customers by sending them emails, cancel/refund the order and even print the order. Did you buy Magento 2 Fastway Shipping? + Price Calculation for weight above 25Kg implemented. + Calculate Shipping Cost According to Fastway Shipping. + Admin can enable and disable the Module. + Shipping Rate depends on Admin's Regional Franchise and Product weight.